Because we haven’t had enough dire reports this fall, let’s throw one more log on the fire, shall we? A report released on Wednesday chronicles how human health around the world is already suffering from climate change, and the top line statistics are pretty stunning. The Lancet Countdown is in its third iteration, presenting an annual checkup by climate scientists, doctors, and public health experts on the health of our planet and the 7.5 billion of us who call it home. The prognosis isn’t so good. Burning fossil fuels has created unhealthy air, dangerous floods and droughts, and deadly storms. And with no clearer impact than rising temperatures, heat is among the biggest sources of misery. In 2017, there were 157 million more vulnerable people exposed to heat waves than the 1986-2005 average. That total represents the highest ever recorded in a non-El Niño year (El Niño tends to boost temperatures around the globe as a whole), driven by rising temperatures and more people living in urban areas, which tend to swelter a bit more. 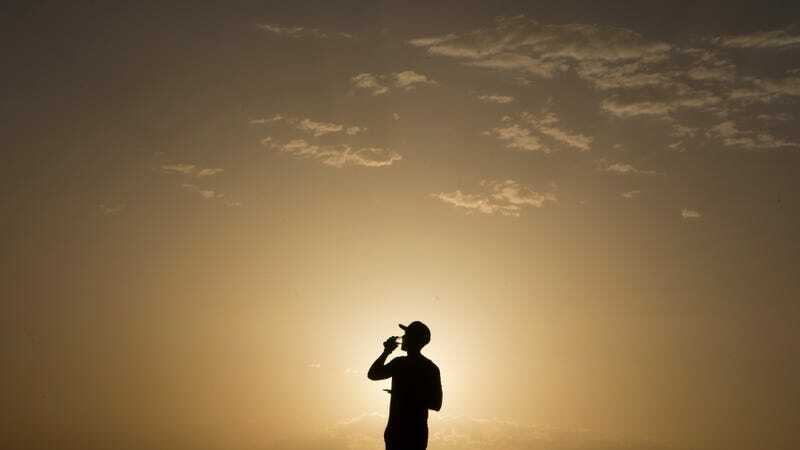 The report notes that this impacts health directly through heat-related illnesses as well as indirectly via killing crops and livestock, which can then cause food insecurity. The risk is hardly limited to poor countries, though they continue to suffer the most. The rapidly aging population in Europe, for example, means that more people are becoming vulnerable to heat-related illnesses in places where hot weather hasn’t always been such a regular occurrence. Heat waves are also resulting in an astounding loss in productivity. An almost unfathomable 153 billion hours of labor were wiped out last year because it was either too hot to work or even go outside, a 62 billion hour rise compared to 2000. That’s the equivalent of roughly 45 percent of the world’s population losing a week of work. While workers all deserve more time off, doing so because its too dangerous to do your job is not exactly the ideal way to get a break. Eighty percent of the losses were in the agriculture industry, with the biggest losses near the equator, including sub-Saharan Africa, India, Southeast Asia, and the northern portion of South America. Those are places where agriculture isn’t just a means of production but a means of survival. In sub-Saharan Africa, 70 percent of the population works on smallholder farms for income and food. Being unable to work the fields is can ratchet up food insecurity for a huge portion of the population, showing the cascading effects of climate change. Perhaps the most alarming news of all is that the heat is rising faster where we live than across the globe as a while. The report found that the temperature where people live has risen 0.8 degrees Celsius since 2000 while the globe as a whole has warmed 0.3 degrees Celsius. The relentless heat has continued into 2018, including right now in Australia where summer is just getting going. And it’s only going to get hotter, which is in part by a medical journal like the Lancet is calling for a rapid phase out of fossil fuels while scaling up renewables. It even calls out the U.S. for announcing it’s going to bail on the Paris Agreement while suggesting we need more international ambition. If you plan to go all NRA “stay in your lane” about doctors talking about climate policy, maybe sit this one out.